Below the Falls the Zambezi zig-zags in a southerly direction through the steadily deepening Batoka Gorge, as it descends some 260m, its power and flow concentrated in the narrow channel and flowing over 60 rapids, and one waterfall, the Moemba Falls (some 50 km downstream of the Falls), until it emerges from the basaltic plateau and turns east where it is drowned under the waters of Lake Kariba and its dam, 240km from the Falls. At the Victoria Falls the Zambezi river plunges into a narrow gorge with precipitous sides, some 400 feet deep. The river, which above the Falls attains in one place a breadth of 2 miles, is confined in a rocky channel only a few yards broad. This gorge continues for more than 40 miles down stream from its point of origin and finally debouches into what is generally known as the Gwembe valley. The sides do not remain uniformly steep for, although isolated rocks and cliffs stand out at intervals, numerous streams and rivers flowing down on either hand have cut back the sides of the gorge and made access to it no easy task in the immediate vicinity of the Victoria Falls. At the same time these tributary waters have created on either side of the Zambezi an ever-widening strip of mountainous, inaccessible, and uninhabited country. The Zambezi in this part of its course has no very large affluents. The first tributary is the Kalomo river which flows in on the left bank somewhere about 25 miles below the Falls. The exact distance has never been accurately determined, and so far as I know no one has ever explored this section of the river and left any record of the journey. At the Kalomo confluence the gorge is bounded by steep hills and the Zambezi is on average 100 to 150 yards broad. Thirty miles below the Kalomo the Matetsi river joins on the right bank, and 15 miles below the Matetsi the Deka; another 15 miles and the Gwaai confluence is reached. Both the latter joining from the right bank... Below the Gwaai river one may said to enter the Gwembe valley. Lake Kariba was created in 1959 following the completion of the Kariba Dam (constructed between 1956 and 1959), impounded a lake some 280 km long with an average width of 18 km (and a maximum width of 32km), and a reservoir surface area of some 5,580 km2 and containing some 185 billion cubic meters of water at full supply level. At the time of construction it was the largest man-made lake in the world (as of 2008 it is the third largest). 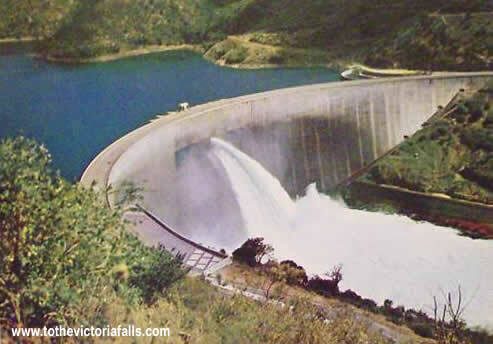 The hydroelectric power-generating facilities provide electricity to much of Zambia and Zimbabwe. The formation of Lake Kariba resulted in the drowning the Gwembe Valley, home of the Tonga people. The flooding of the river valley displaced over 57,000 Tonga/Korekore people from their traditional lands. These displaced people were inadequately resettled and compensated and they still feel embittered to this day. Below Kariba, the Zambezi is swollen from the north by the Kafue River as the Zambezi runs between Zimbabwe’s Mana Pools and Zambia’s Lower Zambezi National Parks, both equally famous for their wildlife. Despite National Park status and protection, both areas are under threat of mining and development, with the Zambian Government currently proposing a huge open cast mine within the Lower Zambezi National Park and the Zimbabwean Government recently proposing the industrical extraction of river gravel sediments. 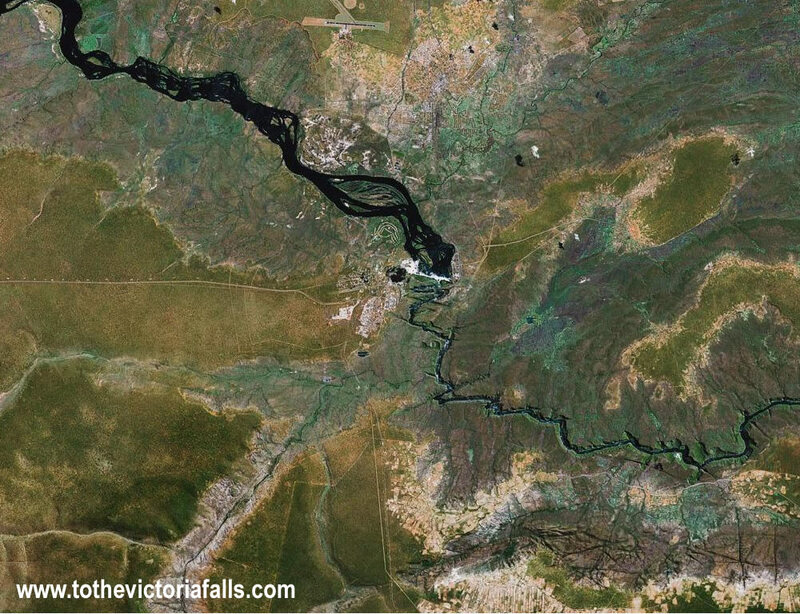 For more on mining and other development threats to the Zambezi see Victoria Falls Bits and Blogs here (external site, opens in a new window). At its junction with the Luangwa River, and after forming the international boundary between Zambia and Zimbabwe for approximately 500 km, the river enters into Mozambique. The middle Zambezi ends when the river enters Lake Cabora Bassa. Much of the flat valley and steep escarpments in Zambia and Zimbabwe within the Middle Zambezi valley have been set aside as safari and wildlife management areas. In combination, they stretch from Lake Kariba to the eastern reaches of Lake Cahora Bassa. Part of this region, comprising Mana Pools, Sapi and Chewore, stands out as one of the important remaining wilderness areas in the savannas of Africa, and is appropriately designated as a UNESCO World Heritage Site (Frost et al., 2002). Both times Livingstone visited the Falls, in 1855 and again in 1860, he had left the rough, broken country through which the middle Zambezi flows below the Falls and taken the easier route eastwards across the higher, cooler Batoka Plateau. By straying from the course of the Zambezi, Livingstone failed to comprehend the character of the middle reaches of the river, where a series of gorges forced the Zambezi into narrow, turbulent, white-water stretches un-navigable to transport.